9 Clare Horse Show Rosette | Hodges Badge Company, Inc. 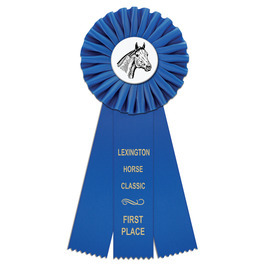 The 9" Clare Rosette horse show award ribbon is perfect for any equestrian show or event. The quality of each handmade rosette award ribbon mirrors the hard work and accomplishments of its recipient. This horse show rosette features a tightly pleated top and three streamers. Each horse show award rosette can be customized with a full color design (your design or one of our stock designs) printed in the center of the top on a button center. Once you have your design picked out, customize each award ribbon with your event information in up to 7 lines of print with 14 characters each in one of our metallic print colors.